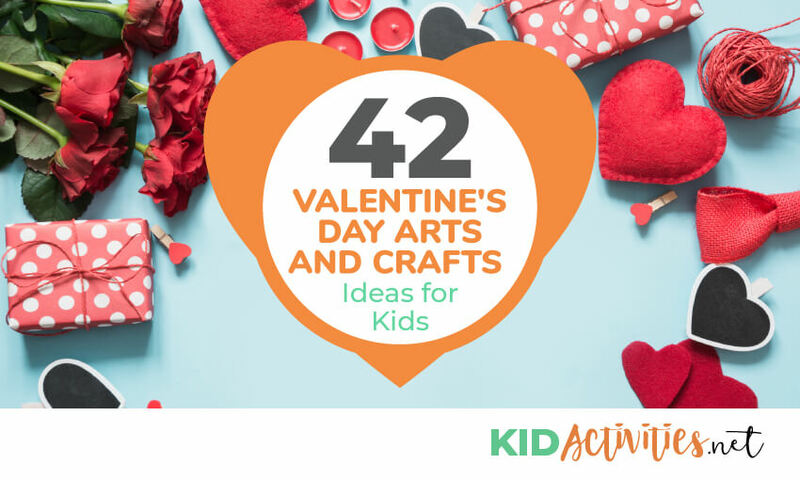 Looking for some great Valentine’s Day art and craft ideas? Look no further. Here you will find a large collection of activities that will engage kids creative mind. ♥ Kids illustrate this at the top of the paper. ♥ Bind all of the pages into a book. Parents love reading these! not much bigger than the paper. 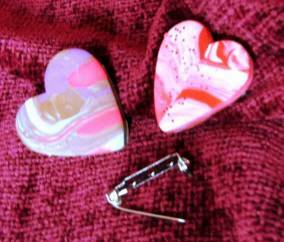 ♥ Dip marbles into pink and red paint. Drop the marbles into the box and have children twist and turn the box. —You can also do this using the traditional method of box painting. Put a small plop of paint in each corner of the box. Place something ’round (such as a marble/golf ball) and roll it around until the desired effect is achieved. You’ll need one bar of Ivory soap; 1/4 cup water; 2 drops of food coloring; and a good kitchen grater and essential oils if wanted. ♥ Have youth finely grate the soap into a big bowl. ♥ Shape the soap into balls and dry overnight. ♥ Wrap in netting and tie up with a pretty ribbon. If you want your soaps scented, you can add a few drops of essential oil or soap scent. Most craft stores carry this. I read that you can also pack soap mixture into cookie cutters-and then dry overnight—but I’ve never done this. 2. Cut shapes with cookie cutter. Finished pin from ‘top to bottom point’ is 1 1/4 inches long. Larger cookie-cutters would make a pin too ‘heavy’. Place shapes on wire rack to dry and harden. 3. When dry, sand any rough edges. 4. The heart may be sealed with clear nail polish or a protective coating of a clear surface finish. Repeat as necessary to achieve the level of desired gloss. Note: A few pinches of glitter was added into the play dough for one of the pins. This part is optional. ♥ Kids will get a kick out of these silly valentines. Cut out medium sized red hearts. Write “I’m Stuck on You” on each heart. 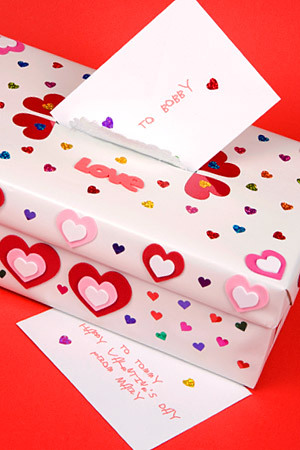 ♥ Set out band aids and have children stick a band aid on each valentine! 2. Paint half a heart on one side of the paper. 4. Repeat the process if necessary (outlining the heart) until the paper is full of color. EXTENSION IDEA: Turn the ‘blotto ar’t into cards! Put out a variey of supplies and challenge the children’s creativity. As shown in this sample, ‘R’ made a ‘stamp’ out of a valentine eraser (see the above ‘tooth pick in the heart eraser shape) and made heart designs on the cover after dipping the stamp into tempera paint. On the inside of the card–a google-eye is glued to the upper left corner (with added eye lashes). It is followed by the ‘blotto heart” and then a ‘U’. (I love you!) ‘R’ completed the card by spraying a fine mist of hair spray (Aqua-net) onto the card and sprinkleded glitter. This kept the glitter on the card. Cut heart shapes out of card-stock or construction paper. Paint with shades of red and pink. Sprinkle salt on the hearts while paint is still wet. Hearts will sparkle when dry. 1. Start with a large sheet of paper or construction paper. 2. Take old magazines and the advertisements from papers. Look for anything Valentine’s Day related, such as hearts, flowers, and candies. 3. 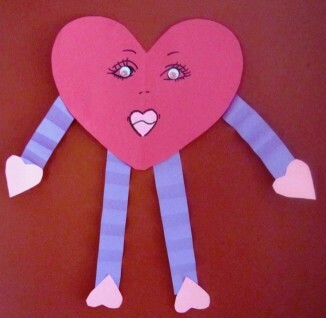 Have child create a Valentine Collage with these magazine cutouts. Use markers, crayons and stickers to further decorate it. 4. Hang the finished collages for a Valentine’s Day display. 3. Place a piece of white paper over the heart and rub a crayon (with the wrapper removed) sideways over the shape. ♥ Invite children to brainstorm special things they can do for the recipient of their gift—-such as-give a hug, tell a funny joke, sing a song, take out the garbage, vacuum a room, put away the dishes, etc. ♥ Write their responses on 3″X6″ strips of paper. Help the children wrap the strips tightly around a pencil to create scrolls. 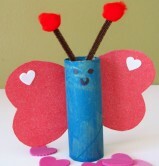 ♥ Decorate a plain paper bag with festive Valentine craft items, drawings, stickers and glitter glue. ♥ After the bag is dry– put the scrolls inside the bag. Fold down the top of the bag-punch two holes and thread ribbon through the holes. Tie and create a bow. White paper, Smock or old shirts. 1. Add a drop of red food coloring to a baseball-sized pile of shaving cream. 2. Mix this with a paint brush. Wear cover over clothing as the food coloring will stain clothes and hands. 3. Paint with the shaving cream on white paper. 1. Both ‘Valentine Butterflies’ are similar but ‘R’ added a head and double wings. The wings have been cut out from the center of Valentine Doilies-however-construction paper hearts can also be used. The wings are glued over each other onto the back of the paper tube. 2. 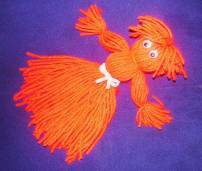 The pom-pom head sits on top of the tube and a full length ‘pipe cleaner antenna’ fold into the tube. (It’s size and thickness holds it in place) The mouth and nose are made from ‘bits’ cut out of foam. Small ‘stick on’ foam hearts decorate the wings. 1. Use the cardboard heart template to trace two hearts onto the felt. Cut out hearts and place one on top of the other. 2. Put a safety pin through the middle of the hearts to hold them in place while gluing. 3. Glue the two pieces of felt together along the edge leaving a 3″ opening. 4. Use fabric paint to add a child’s name to the top of each pillow; let dry. 5. Stuff the heart with fiberfill and glue pillow shut. Materials: Construction paper, Scissors, Paper plates, Glue, Yarn or ribbon. 1. 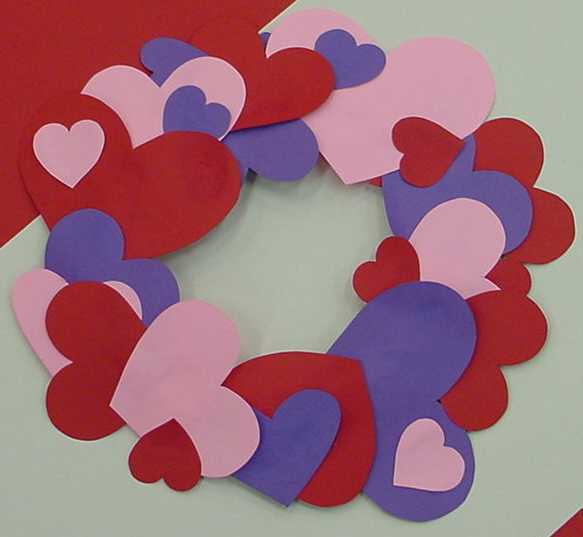 Cut out different sized hearts from red, purple and pink paper; you’ll need many for each wreath. 2. Cut the middle out of a paper plate and glue the hearts all around the plate. Need: Clip-on clothes pins, red paint, pink construction paper, black paper. 1. Have children color their clothes pin red. 4. Next glue the heart faces on the top “clip-end” part of the clothespin. 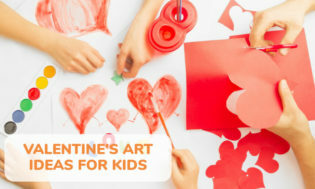 Give children two larger pink paper heart shapes to decorate with crayons, markers, glitter, etc. Have them then glue two of the hearts together to make “wings” from their clothespin body. The heart points will be touching each other on the inside and the fullness of hearts will be on the “wing ends”. 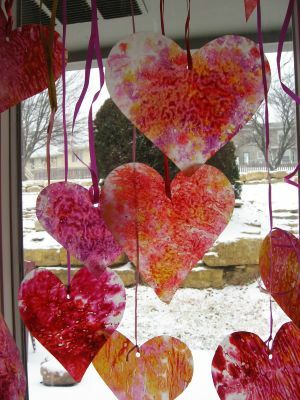 Make stained glass hearts by placing red, pink and white crayon shavings between two pieces of wax paper. Cover the top with newspaper and press a warm (lowest setting) iron to melt the crayon chips. Allow to cool completely. Using cardboard, tag board, or empty cereal boxes, make heart shape templates for the children to trace. Tape these over the waxed paper and trace the templates. Cut out the shape–hole-punch–attach string, ribbon or fish line! This wonderful example is from Skip to my Lou! Be sure to make a bunch! Take a cupcake paper and pinch the bottom of it. Take a pipe cleaner and wrap it around the pinched area. Cut some leaves out of green paper and add them to the pipe cleaner. When the play dough dries flowers should stand nicely. You can also decorate some tissue paper to cover the outside of the jar. 1. Paint the jigsaw puzzle pieces red and let them dry. Painting both sides is optional. If you want to hang the heart in a window, it would be best to paint both sides. 2. Lay them out in a heart shape. When laying out the shape, place one piece under the next overlapping the top piece each time. 3. With tacky glue, glue the pieces to one another and let dry. 4. After the heart has dried, put a coat of Modge Podge all over it and let dry. This will make the heart very shiny. 5. Glue sequins and pearls all around to decorate. Let them dry thoroughly. 1. Take a small terra cotta pot; have children sponge paint with red and white paint. 2. When dry add Hershey kisses. 3. 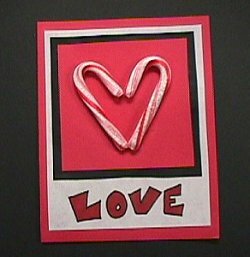 Make and glue a large red construction paper heart to a Tongue depressor size Popsicle stick. 4. Put a message on it and then insert it in the center of kisses. 5. If it’s a gift–wrap it with red or pink cellophane and add a pretty bow just below the heart. Have any post Christmas candy canes? Hot glue two candy canes together at the tips. They make a perfectly shaped heart! Put out construction paper, paper doilies, the candy canes, markers, ribbons, etc. Next, challenge the children to use their imagination in creating cards! If you have small photos of the children, you could glue these in the center of the hearts. This card has been made by Ms. Jane at the Kansas City Public Library. ♥ Rub the individual, different colors of chalk into each salt container to get the desired shades. ♥ Have children write their messages on the cards before they decorate them. ♥ Next, have children make designs on the paper by first making designs with glue on the cards; they then put the colored chalk or sand over the glue designs. ♥ Dry for half a day. 1. Cook spaghetti noodles, drain and cool. 2. Fill a gallon Ziplock bag one quarter of the way with water. 3. Add red food coloring to the water. 4. Add cooked spaghetti and mix around in the Ziplock bag until noodles change color. Drain. 1. Starting at the top of the sucker stick, tightly wrap a chenille stem in a coil around it. 2. Cut off remaining pieces of chenille- about 3 inches. 3. Twist the small piece of the chenille around the stem where you want the flower leaves to be. 4. Shape the leaves and twist to secure. 5. If you want to add a name tape or note, cut a piece of paper and make a hole with a hole punch. Draw a very large heart out of cardboard or card stock paper. Laminate it and cut into pieces to put back together as a puzzle. Save pieces in plastic baggie marked with the title of the heart. ♥ Students then Mail their letters. On Valentine’s Day, students mail each other their Valentine’s as well. Have a “MAKE A VALENTINE HEART” by tearing paper contest! Craft and Game in one! 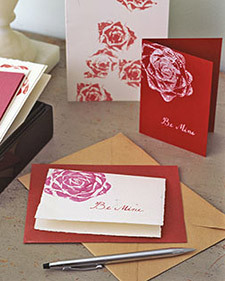 ♥ Have each participant hold a piece of valentine colored construction paper in your hands–behind their back. ♥ They tear the paper into a heart shape without looking at what they are doing. ♥ Who’s created the most “heart-looking” heart shape!? Check out the VALENTINE JOKES PAGE…Fun as jokes–but also wonderful for making cards! Put the ‘Question’ on the card cover…and the ‘Answer’ on the inside. Illustrate and decorate as each joke indicates! ♥ Give each child a heart doily. ♥ Have children decorate them with markers or heart stickers. ♥ Next glue the doily in the center of a 2″x 20″ strip of red paper. ♥ Wrap each child’s strip around his/her head and tape it in place to make a crown. 1. Begin by laying out three feet of plastic wrap, cutting it in half lengthwise. Place candies or groups of candies every three inches. 2. Roll the plastic over and tie bows BETWEEN each candy -using six-inch strips of ribbon. 3. Tie the two ends of the plastic wrap together and cover the knot with another ribbon. Wear now and eat later! We’ve all done stamp art using cut fruits and vegetables…where we dip the veggies in paint and print. That’s it! Look at the wonderful creations that can be make with cut cabbage! 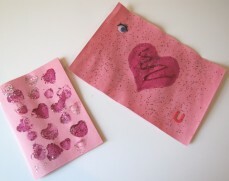 This sample is made using stamp pads…Wonderful for Valentine’s Day! NOTE: KidActivities hasn’t tried it–but has been told that celery used the same way–works as well. 29. MAKE SOME LIQUID STARCH RED PAINT! ♥ Clean the jars well and let dry. You can use small jars…but check the size of the votive candle to make sure it will fit. ♥ Have the children brush glue onto the jar and place different colors of tissue paper over the glue, overlapping so the entire jar is covered on the outside. ♥ When brushing the tissue with glue be sure to do so gently so it doesn’t tear. If it tears, remove or leave wrinkled. ♥ The glue will appear to be white but will dry clear and when a candle is lit inside will give off a pretty color and design. 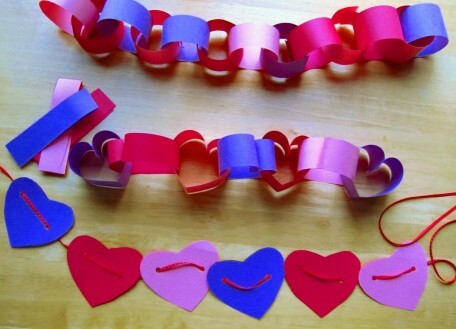 ♥ Make a heart garland for Valentine’s Day. ♥ Cut heart shapes out of red , pink, and purple construction paper or craft foam. ♥ Use a hole-punch to make a hole in each side of the heart. 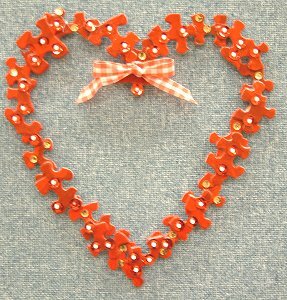 ♥ Use ribbon or yarn to tie all the heart together into a garland. Hang from ceiling or down a wall. Paper chains looped from the ceiling are always festive! Depending on the age of the children, after the paper strips are cut…they can be attached using glue sticks, scotch tape or staples. (Staples are the fastest) Of course–use pink, read, and purple construction paper. All you need are pipe cleaners in Valentine colors of your choice! ♥ Take the two ‘top strips’ that are not folded–and touching them together—fold them down into a heart-top. Staple this to complet the shape. Large foam heart shape and google eyes. 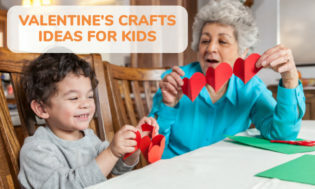 Start by showing children how to make a ‘perfect heart’ using a sheet of construction paper. 1. Fold a sheet of construction paper in half. Draw half a heart on the one side. Leaving the paper folded…follow and cut the half-heart line. Open the sheet of paper and you have a perfect heart. This is the face/body. 2. With the remaining sheets of construction paper–cut out two long strips for the legs and two slightly shorter strips for the arms. Fold the long strips back and forth accordian style. Glue or tape these to the body. 4. Mouth: KidActivities used a large foam heart-shape for the mouth. A curvy line was added in the center to separate the lips and a marker traced the shape for detail. If you don’t have larger sized foam hearts–draw and color in big red lips or smile! Still very cute! 1. Make 2 huge hearts; have each child write/print their name on one of the hearts. Continue to decorate as desired. 2. Leaving an opening, staple the edges of the two heart together. 3. Stuff the heart with recycled paper. 4. When complete, staple the opening shut. 5. Optional: Attach streamers of pink, white and red to the bottom. ♥ Hang the heart with a sign above that says: Our Class has Heart! 35. ‘WALL OF LOVE’ DISPLAY BOARD…Use it many ways! For Valentine’s day the library staff provided a display for students and staff to write messages. Around 150 pink hearts were displayed on the Wall at the entrance to the library. This is something that could easily be adapted to a class or after-school program! Kids could write friendship messages about teachers, friends, places, things, food, etc. Kids love writing on walls–so it could be a hit! This is also a great idea for February’s 100th day of school or National Friendship Month! The hearts could also be filled with Acts of Kindness for February’s Kindness Week! 1. Give each child two pre-cut place mat size ovals cut out of clear self-stick paper. Last. sprinkle on glitter. Complete by removing the backing from the second oval and carefully placing the sticky-side down on the decorated oval. The front of old greeting cards, yarn, tape, hole punch. 1. Punch holes around the edges of cards about half inch to one inch apart. 2. Cut yarn for approximated lengths for lacing. 3. Tape one end of a piece of yarn to the back of each card. 4. Children then lace yarn through then holes in the cards. 5. When they finish, trim the remaining yarn ends and tape them to the back of the card. (lacing will be easier if you dip one end of yarn into wax or glue—or wrap it with tape to make a “needle”. 6. This can be done with any Holiday such as Easter for Easter cards, Christmas, etc. 1. 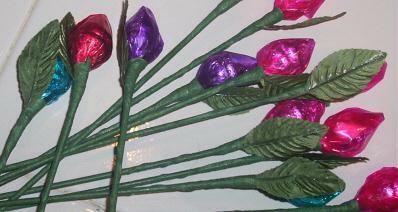 For each candy rose, spread glue on the bottom of one foil-wrapped chocolate. 2. Firmly press the bottom of another chocolate to it. 3. Insert florist wire into one pointed end of the double chocolates, twisting cellophane, continuing down the full length of wire with tape. 4. Add 1 or 2 artificial leaves, if desired, securing leaves in place with florist tape. 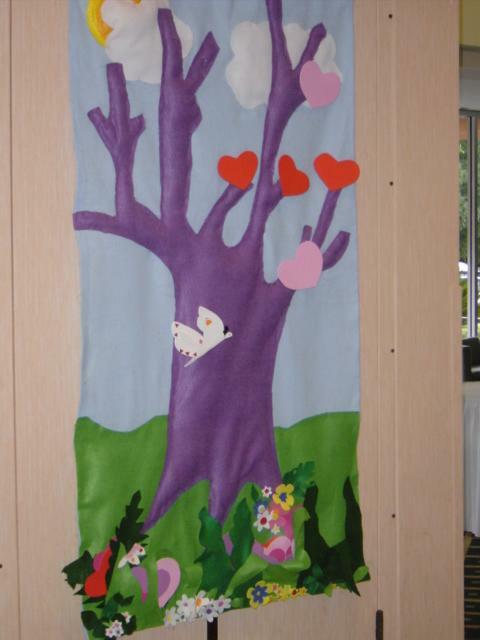 To replicate this idea, after making the tree shape of trunk and branches–add a heart for every kindness act noted. This idea is nice any time of the year, but works especially well in the month of February. Coffee filters, Paintbrush, Red tempera paints, and water. Water down red tempera paint in a container. Then take the paintbrush and paint the coffee filter with the watered down paint. Painting only parts of it will give a tie dyed affect. When it is dry hang them in a window. 4 inches across. On each, draw a nose and eyes. Punch four holes above the mouse’s nose. behind the whiskers, from the backside of the heart. ARM, HAND & FINGER PAINTING!!! MESSY BUT FUN! This is a given…Keep lots of water and paper towel nearby! Messy but the kids will love it!!! •Children’s Crafts that Smell Good! •How about a Teddy Bear and other Bears Theme?! Teddy Bears are wonderful around Valentine’s Day!